I wouldn’t expect to see this much warm color here usually. I think that the reddish color around the spout is not in the rock but a reflection from the setting sun to the right, out of sight from the this viewpoint. The warm color beyond the near clouds to the south was a bonus this evening. 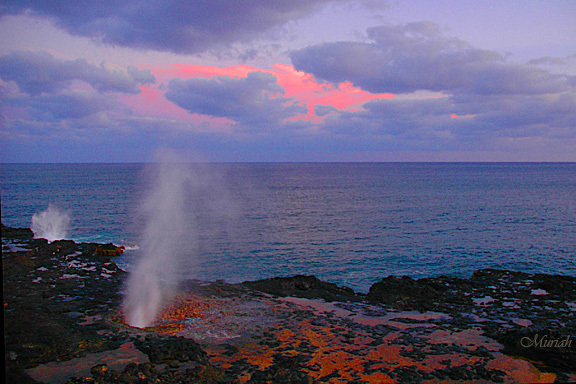 I have seen a photo of this spout with the sunrise behind it. That is probably a more likely time to see interesting colors and formations in the sky. If you haven’t experienced it yet, the sight is not its most fascinating feature. The sound of the fabled giant lizard trapped beneath the solidified lava ranges from a hypnotic exhalation of rest to sudden snorts that startle the senses. Walking by it in the darkness after sunset was eerie. It stirs the imagination and wonder. In the early days, it must have been a wonderous place to visit and stay overnight. Imagine the tales of it among the youngsters. Incredible shot, enjoyed the commentary, Thanks for sharing.